Our Gospels include a comprehensive Plan of Salvation so the reader knows exactly what to do with the information. There's nothing ordinary about our Gospels of John. You may have seen, or even used, tracts and other kinds of publications to share your faith. Perhaps you've used Gospels from other sources. If so, you might be asking yourself what makes our products different. Why are the Gospels from The Pocket Testament League so effective? There are a number of reasons, the result of many small details that work together to make our tools work so well for you. Every pocket-sized Gospel has a colorful and innovative cover that is designed to attract the attention of the recipient. Are you ministering to a dog-lover? A skateboarder? A business person? A military man? A flower lover? We have the ideal pocket-sized Gospel cover for you! There are over 100 covers in a variety of languages to choose from. You are covered for all sharing situations! With most people making a decision within two seconds whether or not to accept your free gift, the design of the cover is vital. Strong, powerful, dramatic designs increase the rate at which these Gospels of John are accepted by people when you offer them. We put a great deal of time and energy into selecting the right images and crafting the visual design of our covers to be as appealing as possible, to meet the needs of the intended audience. In some cases, we'll even use focus groups or surveys to get feedback on cover design choices to see how audiences react to them. When people feel that you care about their interests by handing them something they can relate to, they are more likely to respond favorably. And they're more likely to read the precious words inside. No words of man can be as effective for evangelism as the Word of God. When you give someone a Gospel with a cover design related to a personal interest of theirs, it can create a desire to open the book and see what's inside, providing an even greater opportunity for people to discover the wonderful message of God's grace. Gospels are available in the New International Version, King James Version, English Standard Version and New Living Translation. Many languages are available including Spanish, Italian, Japanese, Traditional Chinese, Simplified Chinese, Portuguese, German, and Russian. Along with the text of the book of John, our Gospels include a comprehensive Plan of Salvation. 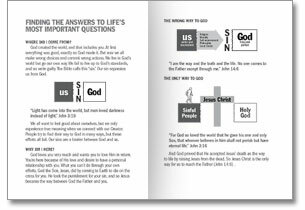 This is an entire section describing with diagrams and Scripture verses the essence of a salvation decision. We provide a suggested prayer, and steps the new believer should take following a decision for Christ. Our Gospels even feature a "Decision" page on which those who have made a decision for Christ can record the information as a reminder of their decision. The interactive process of filling in the details helps to make the decision more complete and creates greater conviction to live for Christ. One of the most important aspects of effective evangelism is to provide a way for new believers in Jesus Christ to follow up on their decision, so that they can grow in their faith. We offer a free four-part written correspondence course to accomplish that. A form is included in our Gospels to sign up for the free course, or people can sign up online. We also provide a special feedback form for people who have accepted Christ using one of our Gospels. When completed, these people get an E-mail with more follow-up information to take their faith in Christ to the next level. Sharing your newfound faith is also a vital part of your commitment as a Christian, and what could be more natural than joining The Pocket Testament League and begin giving away the very Gospels that led to your own salvation decision? As members, new Christians can take advantage of our daily Pocket Devotions messages that walk through Scripture verse by verse to build a deeper understanding of the value of God's Word. Our powerful Evangelism Boot Camp program is designed to help teach Christians how to share their faith.